You know the body you want, down to the last curve. This is why you deserve to define your body with personalized, quick, body sculpting treatments. With Cutera's latest fat reduction technology, the truSculpt iD, new body sculpting solution has been designed with this in mind. Utilizing the amazing power of radiofrequency heat, the truSculpt iD is a hands-free device that allows for fat reduction in stubborn areas, which can be addressed at one time. Depending on the areas of the body you wish to address, this advanced technology has the ability to use up to six hands-free handpieces, which can effectively treat the abdomen and flanks, as well as other nearby body parts that require reduction. 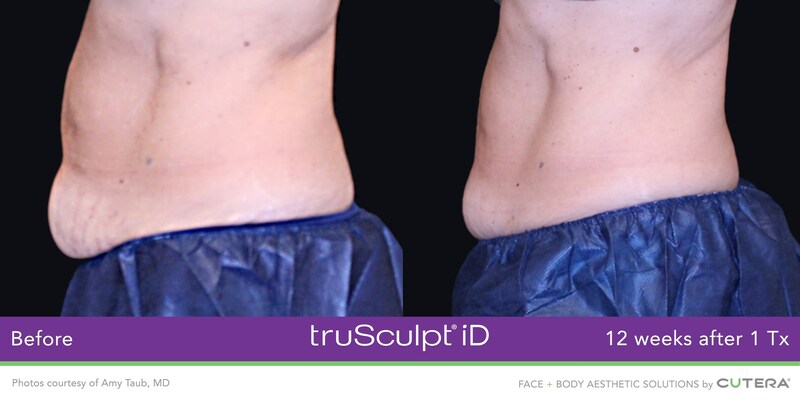 With truSculpt iD, you can get the body definition you want, even in the bulky areas that are resistant to diet and exercise. Unlike surgical liposuction, truSculpt iD does not require needles or an incision of any kind so there is no lengthy recovery period. While the treatment is performed in about 15 minutes, your results will gradually appear over a 12-week period. You will see that the truSculpt iD is worth the short wait! Because truSculpt iD is a customized and tailored treatment to meet individual needs, most adult men and women are a candidate for the truSculpt iD treatments. 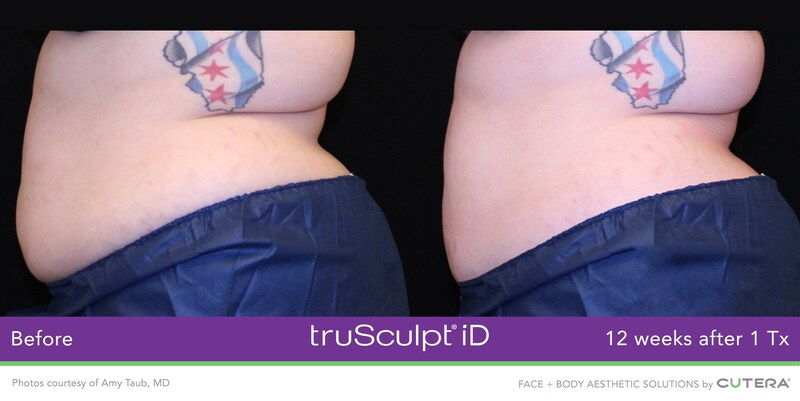 The truSculpt iD can be applied regardless of skin type, fat thickness, and location of the fat. If you have body art, the truSculpt iD can also treat over the skin effectively that has tattoos! This versatile technology is changing the lives of many people who may not have been an ideal candidate before. In your scheduled pre-treatment consultation, you will meet with your truSculpt iD provider to evaluate the areas of your body that bother you. Measurements will be taken and “before” photos documented so that you can see the comparison results 12 weeks after the treatment has been completed. The goal during the consultation is to understand what bothers you and what areas on the body you want to see improvement. A custom treatment plan will be created, which will include the protocol to use and the number of treatment sessions it will take to attain your desired outcome. In most cases, patients will have their consultation and then come back for a treatment session. Before your treatment, it is important to be well hydrated. In addition, the skin needs to be free of any makeup, lotions, or perfume. If there is an area that is being addressed that has hair, it will need to be shaved prior to treatment. This allows the handpiece to make better contact with your skin and target the treatment areas with precision. With the hands-free option, the truSculpt iD handpieces (up to six) will be placed on the area and remain stationary. Your skin will begin to feel warm and the sensation will intensify as the temperature increases. Because of the built-in state-of-the-art temperature-control settings on the device, most patients report feeling like they are simply having a hot stone massage. 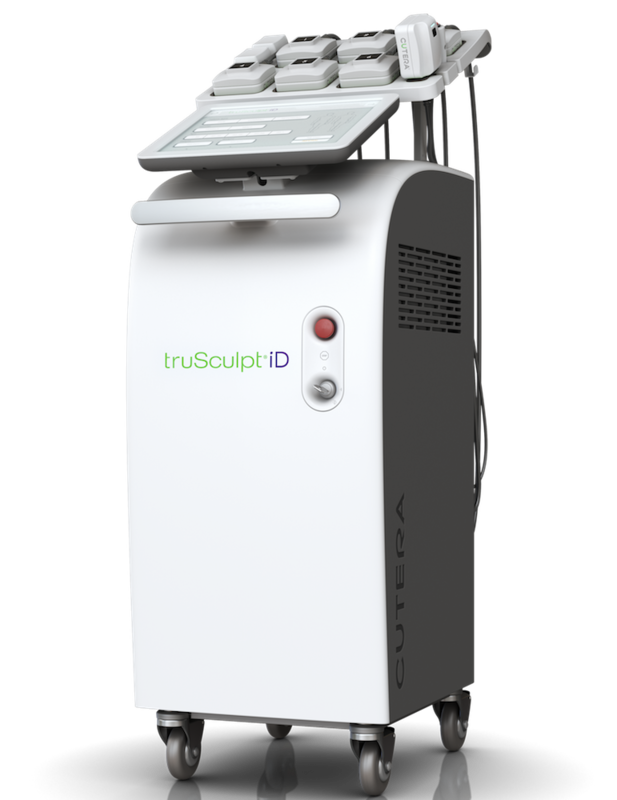 Whether you have a very small, petite area to treat, or a larger section of the body, truSculpt iD is designed to be able to garner the right results. Your skin may be warm and flushed for a few hours after the treatment and tender to the touch for up to a few days. The results will take between 6-12 weeks to visualize as it takes time for the fat cells to be eliminated from your body. Many patients see visible changes in the shape of their body from only one treatment. Additional truSculpt iD sessions may be required for you to see the ideal results you want from this innovative, nonsurgical, fat reduction treatment for the abdomen and flanks.